A few years back I bought a bottle of honey at the grocery store. It was delicious. It made my coffee taste sweet. But then I was told that it was probably fake. Just sugar syrup. Not honey. I couldn't believe it but I couldn't shake the idea either so I ended up testing the honey by pouring a spoonful into a glass of water. The water test says if the honey dissolves then its not real honey. The honey dissolved and I was very disappointed. But I really wanted honey so the search began. At one point I even bought a bottle from a guy on the street who had a bucket full of sweet sticky honey. There was even a honeycomb with a bee on it in the bucket. He filled a bottle, I took it back home, and it turned out to be fake. Eventually I did find real honey from local sellers and direct from bee farms but it's usually expensive and so few and far between. A special treat. 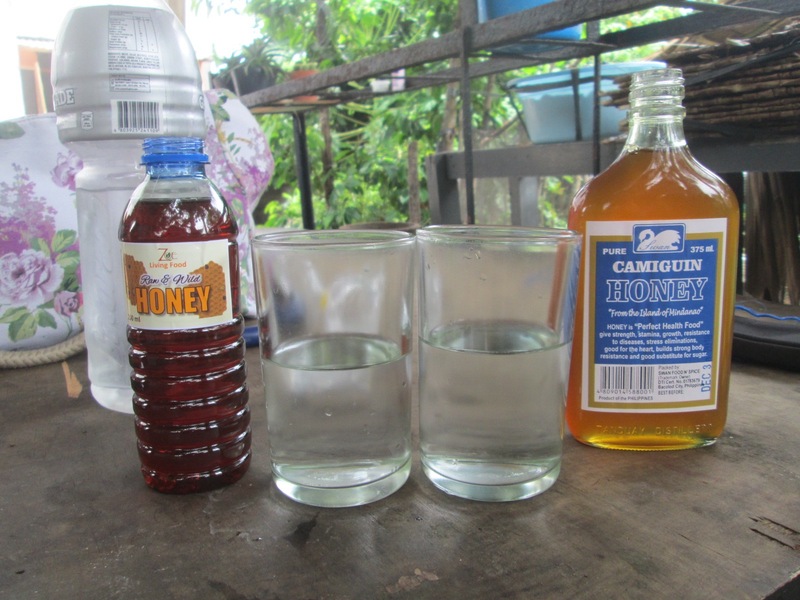 A few months ago I found honey being sold at SM Bacolod at a store called "Sabor Illonggo." It looked good. It was fairly inexpensive. It was in a store selling local delicacies. So I bought it. Great taste. Just like honey. And then, a few months later, it happened. "That's probably not real honey." What? After all this time I have been buying this stuff and now you tell me? But the bottle says real honey. From the island of Mindanao. And it tastes like honey. How can it be fake? Why would specialty store selling regional delicacies be selling fake honey? 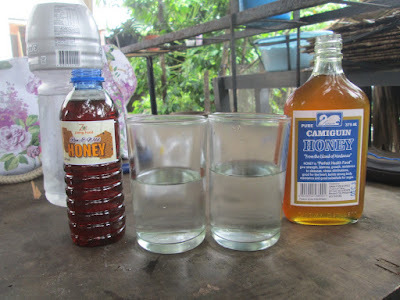 Today a few bottles of real honey from a bee farm in Dolores, Quezon in Luzon arrived. So it was time to put the honey to the test. The bottle labeled Camiguin Honey is the honey I buy from the mall. The other bottle is raw honey recently arrived from Luzon. Two glasses of cold water for the test. Already it's not looking good for the Camiguin honey. See how light the colour is and how it slides around the spoon? The other honey is dark and forms an almost perfect circle while staying in place. 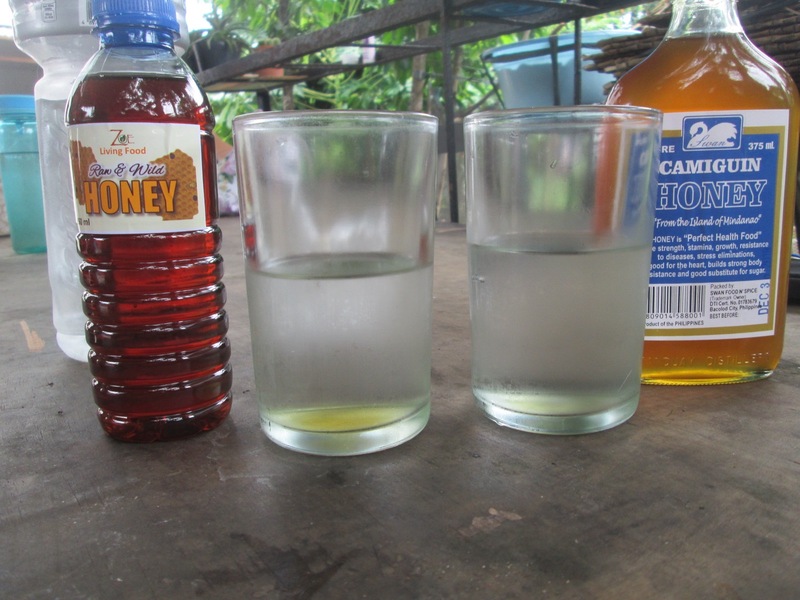 The results of the test: the Camiguin honey completely dissolves in the water while the honey from Luzon sinks to the bottom of the glass. 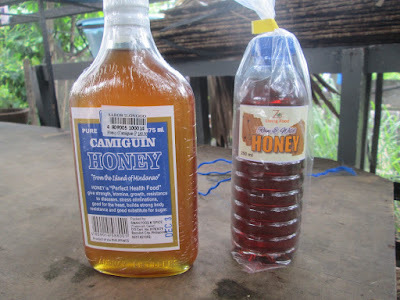 The Camiguin honey is not honey. Not pure honey anyway. The taste is different too. The Camiguin honey is sweet and mild while the Laguna raw honey is sharp and tangy. 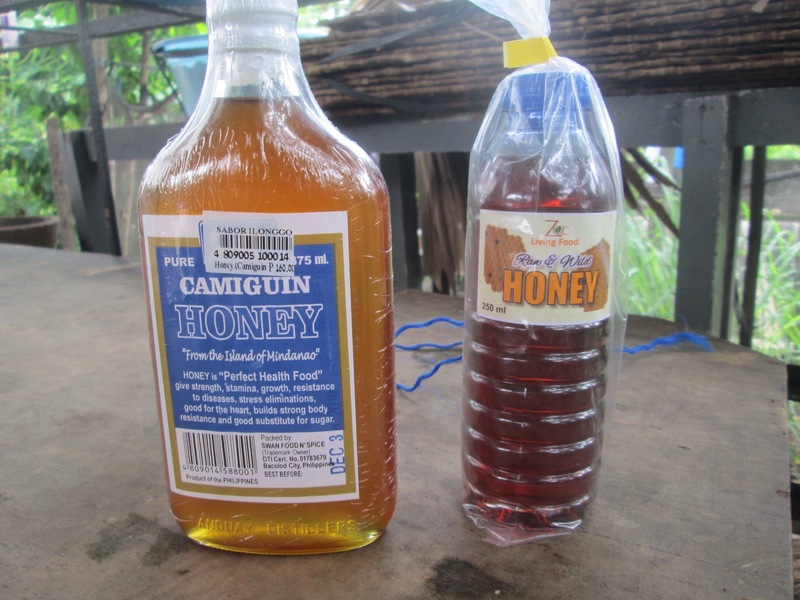 It's hard to believe that Camiguin Honey is fake honey but that appears to be the case. I do not want to sweeten my coffee with sugar syrup so I won't be buying anymore bottles. Fake honey seems to be a real problem in the Philippines. You can read all about it here: http://beephilippines.info/honey-fraud/. Aside from companies manufacturing and selling fake honey it must be wondered how the large supermarkets allow this fake honey to be sold in their stores. Don't they do any sort of quality control and inspection of the companies they deal with? Aren't they aware of FDA warnings and regulations? 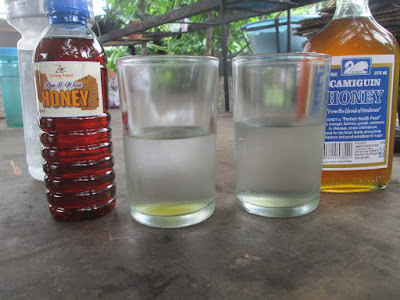 CEM is the king of fake honey and yet can be found in stores throughout the Philippines. Why? Because nobody cares. The supermarkets and the suppliers only want the money. They think their customers are too stupid to realise they are buying fake honey. With enforcement of the law being lax at every level of society it is not too far-fetched to say the FDA doesn't care either. And Filipinos do not complain. You sell a Filipino fake honey and they will try to find a way to make apples out of oranges rather than demand the store give a refund and discontinue selling the fake honey. If you live in Iloilo or Bacolod do not shop at "Sabor Illonggo." And definitely do not buy the fake honey they are selling. Superb article to read. 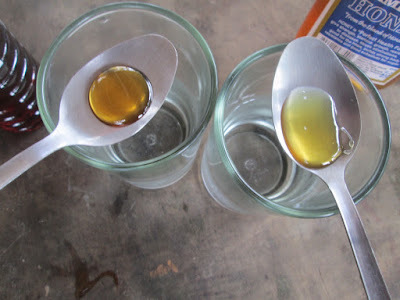 It can create a kind of awareness among people who doesn't know what is real honey and what is fake honey.